State officials have released routing information for trains carrying a volatile grade of crude oil through California. The newly released information reveals that tank cars loaded with oil from the Bakken formation, a volatile crude that has a history of exploding, rumble through downtown Sacramento and through Stockton about once a week. Before they get there, they travel along the Feather River, a major tributary of the Sacramento and a key source of drinking water. They pass through rural Northern California counties -- Modoc, Lassen, Placer, Plumas, Yuba and Butte -- before reaching their destination in Contra Costa County. This is the first time that information about the trains' routing in California and their frequency has been made public. About once a week, a Burlington Northern Santa Fe (BNSF) train enters the state from Oregon, headed for the Kinder Morgan rail yard in Richmond. Each train is carrying a million gallons or more of Bakken crude. "The purpose of the information is really to give first responders better awareness of what's coming through their counties," says Kelly Huston, a deputy director at the Governor's Office of Emergency Services. The notifications (shown below) provided by BNSF to the state list the counties through which the trains pass, and the average number of trains per week. They're retrospective, reporting what's already happened, rather than looking ahead to what trains could be coming. "Right now the information, because it's not very specific, is being used as an awareness tool," said Huston. An emergency order issued by the federal Department of Transportation requires railroads to notify emergency responders about large shipments of Bakken crude. BNSF had asked the OES to sign a non-disclosure agreement, which state officials refused to do. After keeping the notifications secret from the public for a few weeks, the state decided to release them on Wednesday, following the lead of other states that had already done so. 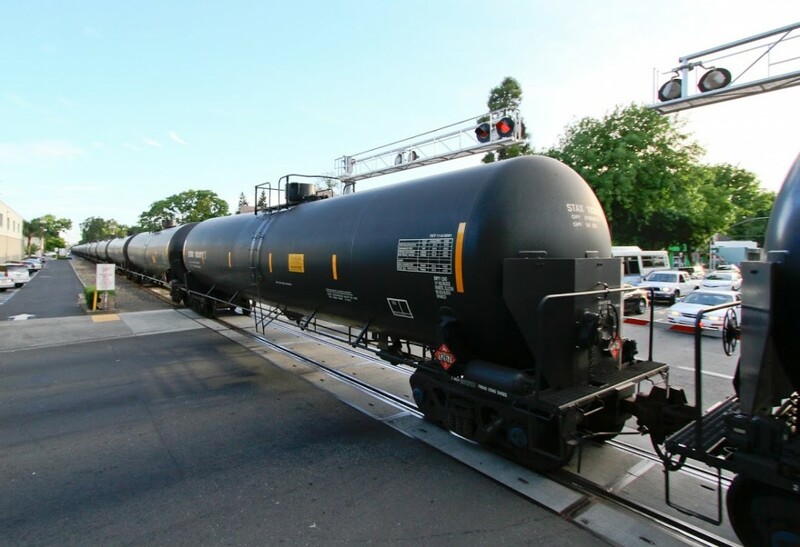 The DOT issued the order after a series of fiery derailments involving Bakken crude in Alabama, North Dakota and Virginia, among other states. Last July, a train carrying oil from the Bakken exploded in a town in Quebec, killing 47 people. “We want the rail companies to do everything they can to ensure public safety,” said Diane Bailey of the Natural Resources Defense Council. She says there are three things that would help assuage her concerns: safer rail cars, slower speed limits, and making sure the trains are always staffed. Butler said the railroads themselves have also pushed to phase out the DOT-111 railcars that have been involved in the accidents. "The rail industry also implemented a number of additional safety operating practices several months ago to reduce the risk of moving crude by rail,” she wrote, “including lower speed limits and had addressed the train securement issue in August of 2013 as part of the Federal Railroad Administration’s emergency order." California lawmakers have introduced bills that would provide more money for oil spill response, and require more information from railroads about hazardous materials. The recently-passed California budget includes a fee on oil entering California by rail, which would help fund the state’s Office of Oil Spill Prevention and Response. It also provides more money to the California Public Utilities Commission for rail safety inspectors. Transporting crude oil by rail is a burgeoning business, thanks to an oil boom in North Dakota. In 2013, more than 6 million barrels of crude oil came into California by rail. In 2008, there were none. Correction: An earlier version of this article incorrectly included Davis in the list of cities the trains pass through.